ENTITLEMENT AND DURATION OF ELIGIBILITY Each eligible person will be entitled to educational assistance for a period of one and one half months of the equivalent in part time training for each month or fraction thereof of his service on active duty after January 31, 1955, but not to exceed 36 months. If an eligible veteran has served a period of 18 months or more after January 31, 1955, and has been released under conditions which would satisfy his active duty obligation he is entitled to educational assistance for 36 months. A veteran may use up to 48 months where he has entitlement under two or more programs; however, all time used under laws administered by the Veterans Administration will be deducted from the maximum entitlement. Eligibility ceases at the end of 8 years from the date of the veteran's last release from active duty after January 31, 1955, except veterans released from active duty before June 1, 1966, have eligibility until May 31, 1974. A veteran discharged before August 31, 1967, who enters farm cooperative, flight or job training will have eligibility for such training until August 30, 1975. MONTHLY PAYMENTS AVAILABLE TO VETERANS Type of Program, No. Dependents, One Dependent, Two Dependents, Each Dependent Over Two Institutional Full Time, $130, $155, $175, $10 Three quarter time, 95, 115, 135,7 Half time, 60, 75, 85, 5 Less than half time or while on active duty, Payments computed at the rate of the established charges for tuition and fees or at the rate of $130 per month for full time course whichever is the lesser Cooperative training, 105, 125, 145 Correspondence, Cost only, Paid quarterly Farm, flight, apprenticeship and on the job training see below Full time institutional training consists of 14 semester hours or the equivalent, three quarter time consists of 10 to 13 semester hours or the equivalent, half time training consists of 7 to 9 semester hours or the equivalent. In correspondence courses the veteran's entitlement is reduced one month for each $130 paid. A cooperative program is a full time program of education which consists of institutional courses and alternate phases of supplemental training in a business or industrial establishment. FARM COOPERATIVE TRAINING. An eligible veteran enrolled in an educational institution for a "farm cooperative" program consisting of institutional agricultural courses shall be eligible to receive an educational assistance allowance at the appropriate rate in the table below. However, the veteran must be concurrently engaged in agricultural employment which is considered to be related to approved institutional courses. FARM COOPERATIVE TRAINING Column 1, Column II, Column III, Column, IV, Column V Basis, No dependents, One dependent, Two dependents, More than two dependents. The amount in Column IV, plus the following for each dependent in excess of two. Full Time, $105, $125, $145, £7 Three quarter time, 75, 90,105,5 Half time, 50, 60,70, 3 APPRENTICESHIP OR OTHER ON JOB TRAINING An eligible veteran may pursue, on a full time basis only, an approved program of apprenticeship or other training on-the-job. Apprenticeships must meet the standards published by the U.S. Secretary of Labor and all apprenticeship or on job training programs must be approved by a State approving agency. The employer's wages to an eligible veteran beginning training on the job shall be at least one half of the wages paid for the job for which he is to be trained. His wages shall be increased on a regular schedule until he is receiving 85 percent of the wages for the job for which he is being trained by at least the last full month of his training period which cannot exceed 2 years. The 2 year limitation does not apply to apprenticeships. Regardless of the wages paid by the employer, VA's monthly training assistance allowance to an eligible veteran pursuing a program of on job training or a program of apprenticeship shall be: Periods of Training, No Dependents, One Dependent, Two or More Dependents. First 6 months, $80,$90, $100 Second 6 months, 60, 70,80 Third 6 months, 40, 50, 60 Fourth and any succeeding 6 month periods, 20, 30, 40 FLIGHT TRAINING. An eligible veteran may take an approved course of flight training generally accepted as necessary to attain a recognized vocational objective in the field of aviation. He must first possess a valid private pilot's license or he must have satisfactorily completed the number of hours of flight training instruction required for a private pilot's licence and meet the medical requirements necessary for a commercial pilot's licence. 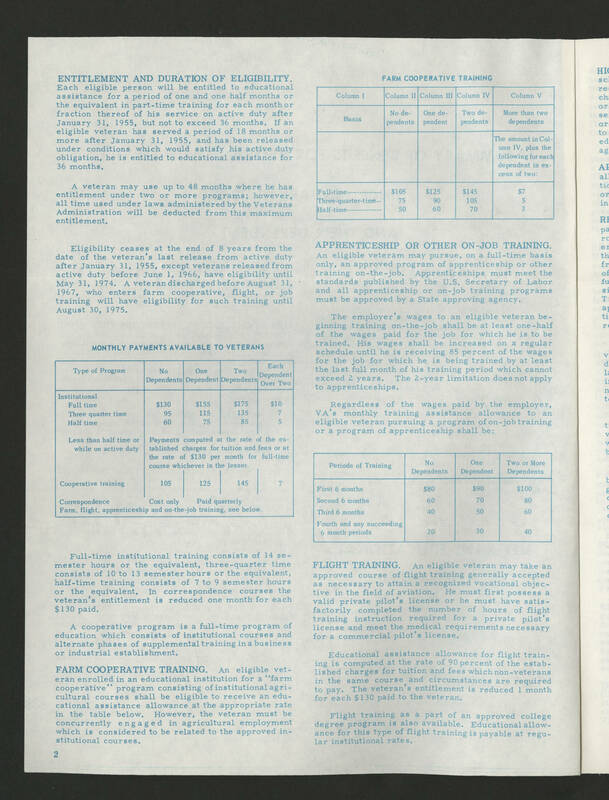 Educational assistance allowance for flight training is computed at the rate of 90 percent of the established charges for tuition anti fees which non veterans in the same course and circumstances are required to pay. The veteran's entitlement is reduced 1 month for each $130 paid to the veteran Flight training as a part of an approved college degree program is also available. Educational allowance for this type of flight training is payable at regular institutional rates.